Saints bounty scandal: Sean Payton brought his year-long suspension on himself. 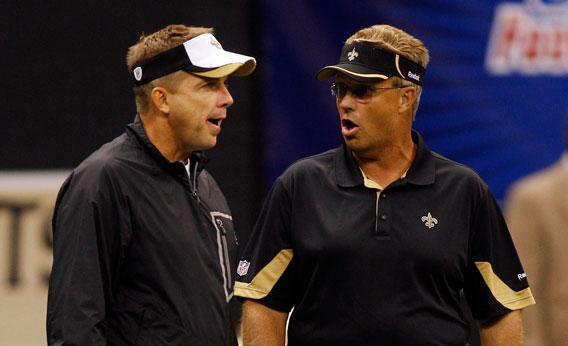 Saints coach Sean Payton and defensive coordinator Gregg Williams in 2010. In the first few hours after commissioner Roger Goodell’s gavel thudded down on the New Orleans Saints, the headlines have been about punishment. The sentence Goodell has imposed for the franchise’s cash-for-cart-offs scheme is extraordinarily severe: a $500,000 fine for the team, the loss of two second-round draft picks, and lengthy suspensions without pay for assistant coach Joe Vitt (six games), general manager Mickey Loomis (eight games), head coach Sean Payton (a full season and the loss of his $7.5 million salary), and former Saints defensive coordinator Gregg Williams (at least a full season, maybe more). The scope of the penalty, however, is nowhere near as fascinating as the crime and the subsequent cover-up. The NFL’s latest report on the bounty scandal lays bare a willfully stupid cabal that broke the rules for no good reason, and—when given an opportunity to fess up—quadrupled down on its initial idiocy. Roger Goodell rules the NFL like a heavy-handed father who lords it over his children. It’s bad to break the rules, but it makes things a lot worse when you disrespect the man in charge. “I don’t think you can be too hard on people that put at risk our players’ health and safety,” Goodell told NFL Network on Wednesday afternoon. “This went on for three years and it was investigated, we were misled, and there were denials throughout that period.” Like Michael Vick before him, Payton invited Goodell’s wrath by lying to his face. The coach—who, when reached by NFL gossip hound Jay Glazer, reportedly said, “I’m not OK”—can complain all he wants, but he set the terms of his own punishment: By acting like he was above the law, Payton ensured that the league’s lawman would have no mercy on him. Even if you don’t buy that the Saints’ bounty system is sui generis, the team’s braintrust has been revealed as singularly delusional. In early 2010, when faced with the NFL’s initial questions about the existence of a bounty program, Payton, Williams, and Loomis played dumb. And despite the existence of a lengthy trail of emails and other documents that detailed the illicit payments, Payton waved the nothing-to-see-here card when the league reopened its investigation in 2012. In the face of such unassailable evidence, why did they clam up? My best guess is that the Saints’ 2010 Super Bowl victory led the staff to close ranks and to continue stuffing cash in envelopes. A confession in the aftermath of such a triumphant moment would’ve devastated the franchise and the team’s fans. At the same time, the Super Bowl win led the Saints’ brass to the erroneous conclusion that the bounties had worked—that the team’s positive turnover ratio in the 2009-10 season was the result of a highly motivated, “nasty” defense. If the cash payments made New Orleans’ defense better, the effect wore off quickly. In 2011, the blitz-happy Saints finished third-to-last in the NFL in passing yards allowed and 28th in interceptions. That’s the ultimate irony: The team concocted an elaborate super-structure of malfeasance that led to its defense being terrible. Since Goodell has yet to announce the suspensions to be levied against Saints players, it’s hard to say whether the bounty affair will cripple the team on the field. Fining the Saints $500,000 and docking them two second-round draft picks won’t have huge on-field consequences, though, and free agents don’t appear to be shunning the team—the Saints signed standout defensive tackle Brodrick Bunkley to a five-year deal on Wednesday. Offensive coordinator Pete Carmichael also proved capable of orchestrating the team’s prolific scoring attack last season when Payton was exiled to the press box with a broken leg, and new defensive coordinator Steve Spagnuolo has head-coaching experience as well. When the bounties get toted up, then, it’s likely to be Sean Payton who loses the most. The head coach, universally thought of as a play-calling genius, has gotten much of the credit for the team’s turnaround over the last five years. If the Saints keep on winning without him on the sidelines, he’ll suffer yet another blow to his reputation. In the end, Payton will have been exposed as arrogant, irrational, and—worst of all—inessential.